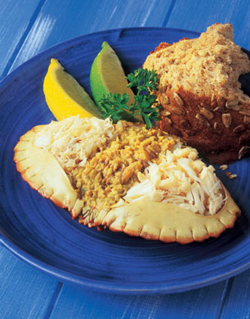 Mix together the crab, mayo, spring onion and flat-leaf parsley. Form into 12 small cakes then dip in egg and coat in breadcrumbs. Put in the fridge for 30 minutes to firm up. Mix all the remoulade ingredients together. Heat a knob of butter in a non-stick frying pan. 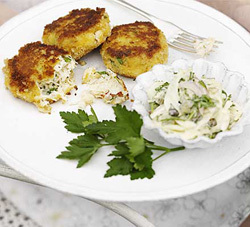 Fry the crab cakes in batches until golden brown. Serve with the remoulade.